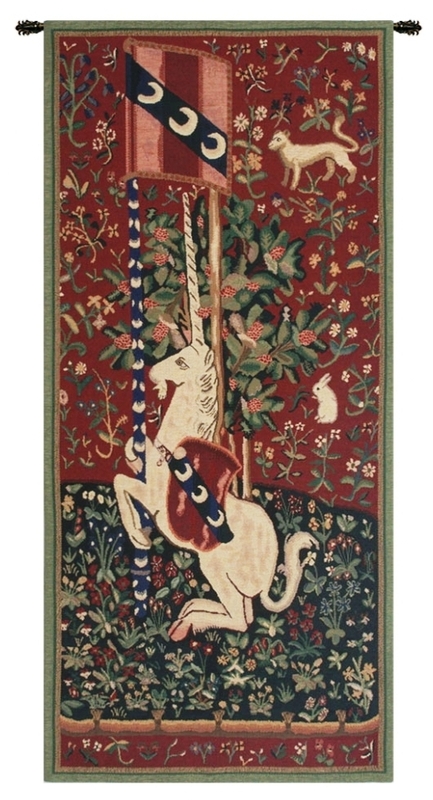 Size: W 21" x H 46"
Portiere de Licorne Belgian tapestry is one of many in the "Lady and the Unicorn" series. This tapestry is a detail of one of the tapestry series: The Lady and the Unicorn (French: La Dame à la licorne). These six tapestries were woven in Flanders from designs ("cartoons") drawn in Paris in the late fifteenth century, and often considered one of the greatest works of art of the Middle Ages in Europe, now in Musée de Cluny in Paris. W 21" x H 46"